The motorcade that snaked through 1 Hacker Way earlier this year surprised even jaded Facebook employees, who are used to on-campus celebrity sightings and visits from politicians and world leaders. So a few days later, at the question-and-answer session that CEO Mark Zuckerberg hosts every Friday, an employee raised a hand to ask about it. It turns out the distinguished visitor — Treasury Secretary Jacob Lew — had not come to see Zuckerberg. Lew’s host? Facebook COO Sheryl Sandberg stood up and acknowledged that she had organized a breakfast with local business leaders for Lew that day. There were a few knowing chuckles, and Zuckerberg moved on to the next question. What seemed quirkily commonplace at Facebook (FB) would have been unthinkable anywhere else in corporate America. Then again, there isn’t, and there has never been, a businessperson quite like Sandberg (No. 5 on our list of Most Powerful Women). Plenty of women have risen to the top ranks of large corporations (though far fewer than men). Some, like Sandberg, who once was a senior official at the Treasury Department, have made successful transitions from Washington to Wall Street or Silicon Valley. Others have achieved fame beyond their roles as executives, and some have written successful books. Sandberg has done all those things, combined them into a singular package, and taken them to a whole new level. Her book, Lean In, is not merely successful: It’s been at the top of bestseller lists and sold more than 1 million copies since its launch in March. Its publication ignited an international movement that made feminism mainstream again, at least among professional women. Sandberg is on a first-name basis not only with the CEOs of America’s biggest companies, but also with celebrities like Oprah, Bono, and Michael Bloomberg, who hosted a glitzy launch party for Lean In. She gets her calls answered by senators, senior White House officials, and prime ministers. And while Sandberg could run just about any company in America (she’s been on virtually every list of possible successors to Steve Ballmer at Microsoft (MSFT, Fortune 500)), she has chosen to be No. 2 at a company where her chances of becoming No. 1 are close to zero. Of course, Sandberg is not your typical No. 2. While her international fame ballooned over the past year following the publication of Lean In, it is how the 44-year-old Sandberg has defined her role as COO and her relationship with her much younger boss that make her so unusual in the business world. There’s no one job description for COOs, but they are almost always inward-facing bureaucrats who make sure the trains run on time, cut a low profile, and toil in the shadow of their bosses. Sandberg, who declined to be interviewed for this article, does keep the trains on time, for sure. But she’s also a chief dealmaker and an ad sales honcho responsible for all of Facebook’s revenue; she taps her influential network to open doors; she travels the world to meet with politicians and channels the desires of the world’s biggest marketers in a language Facebook’s engineers understand. Over the past year, as Zuckerberg shifted gears to turn mobile services into Facebook’s top priority, she pushed the ads and operations teams to follow in lockstep. “She runs the business,” says Dan Rose, one of Facebook’s earliest business-side executives and one of Sandberg’s deputies, in charge of partnerships. 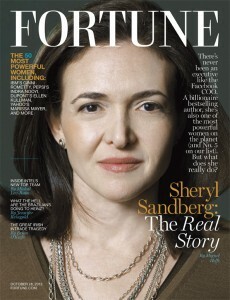 Sandberg’s hefty portfolio and her fluid, trusting relationship with Zuckerberg are liberating for him. She does all the things he doesn’t want to do so he can focus on what he likes: product and engineering. As part of that bargain, he’s given her space to be the public face of Facebook in many arenas, to roam far and wide — from Davos to Sun Valley — and to pursue extracurricular activities, like Lean In, with gusto. While tongues wag that Sandberg’s celebrity and her crusade for women in the workplace are distractions, they are a strategically invaluable asset for Facebook. “Lean In has done a lot more for Facebook than Facebook has done for Lean In,” Zuckerberg recently told employees. The result is this: While Zuckerberg is a celebrity in his own right — and the antihero of an Oscar-winning Hollywood film — Sandberg is not only the world’s most famous COO but also a rock star in business, politics, and popular culture, with unprecedented influence and reach. It’s not just outsiders who wish they could clone Sandberg. Inside Facebook, people can’t seem to get enough of her. She manages to do it all with ruthless efficiency and grace. Don’t let the stories about her leaving at 5:30 p.m. fool you into believing she takes it easy. On most days she walks into Facebook early, sometimes as early as 7, her cellphone glued to her ear. By then, she’s been sending emails for an hour or more. When she’s not traveling or at an evening event, she’ll take a break to have dinner at home with her husband,SurveyMonkey CEO Dave Goldberg, and their two elementary-school-age children. After the kids are tucked in, however, the emails don’t stop until late at night. Her days are a flurry of meetings that she runs with the help of a decidedly undigital spiral-bound notebook. On it, she keeps lists of discussion points and action items. She crosses them off one by one, and once every item on a page is checked, she rips the page off and moves to the next. If every item is done 10 minutes into an hourlong meeting, the meeting is over. This year Sandberg brought her focus and energy to the problem of mobile advertising. As Zuckerberg realigned his engineers and product managers to prioritize mobile apps over the Facebook website, Sandberg rallied the business side. She pushed to simplify ad formats, did away with the emphasis on social ads, and convened biweekly meetings with ad and product executives to balance user experience with the needs of marketers. She bombarded senior managers with lengthy stories of conversations she’d had at theUnilevers (UL) and Procter & Gambles (PG, Fortune 500)and Coca-Colas (KO,Fortune 500) of the world to drill into the heads of Facebook’s engineers the needs of marketers, and she reoriented the company’s sales force. Cataloguing the full scope of Sandberg’s activities and impact inside Facebook is nearly impossible. But her deputies like to single out her strategic involvement with top business leaders with whom she’s developed relationships over time. A few years ago Facebook found itself negotiating a tricky partnership with PayPal. Whenever the teams were stuck, Sandberg would personally reach out to John Donahoe, the CEO of eBay, which owns the payments company. The high-level check-ins ironed out the differences and over time also led to eBay spending far more on Facebook ads. “I like dealing with Sheryl because I trust her enormously,” says Donahoe. How Sandberg, amid all her Facebook activities, managed to write Lean In, orchestrate flashy book tours on three continents, launch a foundation, and become a ubiquitous spokesperson for the ambitions of women, remains baffling to most people. Sensitive to how it would be perceived inside and outside Facebook, Sandberg co-wrote the book with Nell Scovell, a professional writer, during evenings and weekends. She clustered book tours around a few blocks of vacation days — while still answering Facebook emails between events — and set up LeanIn.org as a separate organization in Palo Alto with its own staff. While there is some overlap — communications are often coordinated, and Facebook has lent facilities like video-recording studios to Lean In.org — the two remain separate. With her trademark efficiency, Sandberg has mastered the art of combining Facebook and Lean In business — meeting with advertisers during her book tour in Germany or with government officials while in Beijing, for example. Facebook executives say she hasn’t missed a beat. Privately, some Facebook employees say Lean In was distracting and took much of Sandberg’s time, but only during a brief period in the run-up to its publication. No one has defended her activities more fiercely than Zuckerberg. When an employee asked whether anyone at Facebook was free to write a book, he described Sandberg as “superhuman” and said that anyone who, like Sandberg, could write a book without dropping any balls had his permission. Lean In has turned Sandberg into even more of an international celebrity. But the impact of the book has also been profound inside Facebook, helping with recruiting and retention of women engineers and executives. Most female candidates “reference how attractive Sheryl is to them,” says Emily White, who heads business operations for Instagram, the photo-sharing company Facebook acquired for $1 billion. “It’s almost always in the conversation.” This year, partly as a result of the book, Facebook had a record-breaking number of female interns, says Lori Goler, the head of human resources, though she refused to reveal specific numbers. In the senior ranks, though, Facebook’s record of promoting women has been mixed. Sandberg is one of three C-level executives (the other two, Zuckerberg and CFO David Ebersman, are men), and the company has two women on its nine-member board, slightly above average for large companies. Women executives also lead Facebook’s global sales, public policy, mobile engineering, human resources, European operations, and other important groups. But only one of Sandberg’s five direct reports is a woman, and all of Zuckerberg’s six direct reports, except Sandberg, are male. Regardless, the book has had a major role in changing public perception of the company. As one executive noted, The Social Network depicted Facebook as something of a bawdy college fraternity. “No one thinks of Facebook as a frat house anymore,” the executive said. It’s possible that Zuckerberg himself will have to grapple with those issues some day. There’s long been speculation that Sandberg will leave the company for other pursuits in business or in government. No one knows whether that will be soon. For now, Facebook is still a young, growing company, and Andreessen says Sandberg has vowed to stay at Facebook at least through the “next phase of the company.” (“Sheryl is 100% committed to Facebook,” says Michael Buckley, vice president of global business communications.) Regardless, the publication of Lean In has heightened expectations about Sandberg’s post-Facebook life, especially in Washington. In the past, Sandberg’s future would come up an hour into a dinner; now it’s discussed during the appetizers, says Joe Lockhart, a former White House press secretary under Bill Clinton who was a communications executive at Facebook for more than a year. “It gives a D.C. future more life,” Lockhart says. Some people close to Sandberg say it’s just the opposite. Had she postponed her passion to become an advocate for women, she’d be more likely to be itching to go. The fact that she’s doing Lean In makes it more likely she’ll stay at Facebook longer. At some point, however, Sandberg is likely to be ready for the next thing. But trying to predict her future may be futile: Whatever she does next is sure to be surprising, and bound to once again break the mold. ← Celebrating the International Day of the Girl!